As a church, Coast Hills has a long tradition of putting together fabulous Christmas Productions. Last year, an amazing team of people dreamed up, wrote and directed a broadway style show called Gunch. It's a loose adaptation of the Grinch story that was inspired by the fact that when Grinch was written, it was designed to present the Gospel. The publishing company didn't think it would sell, however, so the story was changed. Our team decided to pick up that torch and write a new story that did tell the Gospel in a clear, compelling yet entertaining manner. This year, Gunch is back. I wanted to call it Gunch: Reloaded, but I was outvoted. Still, that's what it is. The overall story arc is the same, but we've filled in some of the gaps. We're telling a little more of the backstory this year, primarily through a character called Baxstori. It's going to be a great show; but more importantly, it's a great opportunity for our congregation to invite friends and share the story of redemption with them. From a production standpoint it's a big deal. Most of the burden falls on set design/build, lighting and audio. Let's look at our input list, shall we? Click on the image for a PDF versionSorry it's so small, click it to open a PDF Version. With my two foldback channels, I have 40 inputs of band & vocals. That's a fair amount to manage and you can bet there will be snapshots involved. The green block near the end is wireless; 16 channels in all. I actually have 21 people who will be on headset or hair mics and we'll be swapping packs (along with input gain, EQ and dynamics using snapshots) among them. Primaries get their own set for the entire show, while secondary and tertiary characters will share. Managing all that will be our wireless mic wrangler—we've created a position just for that. Because we'll be using backing tracks, played back from ProPresenter with a click, I actually have two click channels. The drummer will control one of them using a small click generator, and I'll be feeding the other one back to them on the click channel in the M-48s. We have a 8-member pit chorus of vocals that will all be on wired mics and will hear using wedges. The rest of the band will be on the M-48s. I think this is going to improve our sound immensely by eliminating at least 8-10 wedges on stage. And since the band will be on the floor in front of the stage, this is a big win. 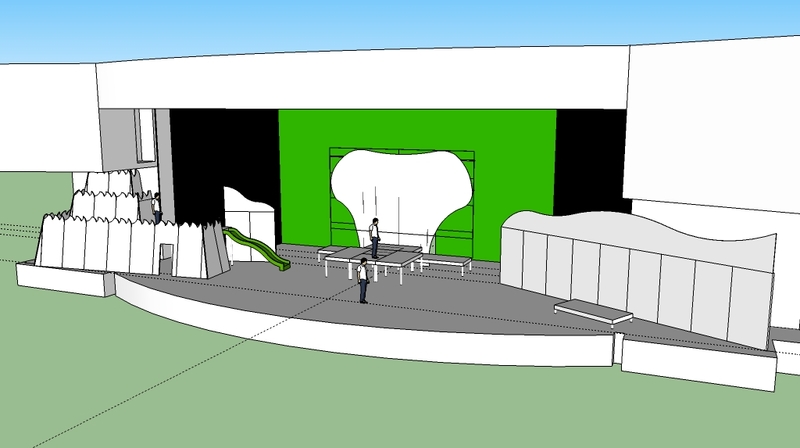 Speaking of stage, below is a preliminary design for the show. The model was built in SketchUp and will serve as a decent guide for actually building the real set. I love using SketchUp because it allows me to spot problems before they occur. The giant chef's hat looking thing will A: not actually look like that and B: be a screen we project on. One of the reasons it won't look like that is because the supports would be visible. We have a new design in process that will be incorporated soon. We also determined that it will not likely stand up on it's own, so we'll be beefing up the bracing. Again, it's nice to think about that in 3D and not when you're scrambling to build it in a week. Lighting is going to be a lot of fun this year as we will be renting in 36 ColorBlasts (in addition to the 12 we already own) and 6 VL2500s. The large structure on stage right is known as Trash Mountain, the home of Gunch. We'll be covering that in white foam, strapping all manner of toys to it and uplighting with the ColorBlasts. The two walls, long and short will also be lit with ColorBlasts. We'll hang 4 VLs over the stage and 2 in the house. As the show is almost 2 hours long, contains 14 scenes and an intermission, there will be a lot of programming. Being able to pre-viz in SketchUp is a great feature.We've already been cutting out and painting the dozens of flats that will be required for the show and this weekend the construction crew will be starting work on a set of stairs we need, a giant present to be used as a prop in one of the songs and a set of six pews. The weekend following Thanksgiving, we'll strike the entire stage and get it ready for the build. We take one whole week to build the set and the rest of the props. The following week, we'll set lighting, program, build out audio, run a band rehearsal, a tech rehearsal, a cue to cue rehearsal and finally a dress rehearsal. On Friday it's lights up for the opening night, followed by 4 performances on the weekend. We've sold over 2500 tickets to date, putting us on track to sell over 4,500. The next few weeks are going to be a ton of work, but I can't wait to see how it all comes together, and more importantly, what God does with it!